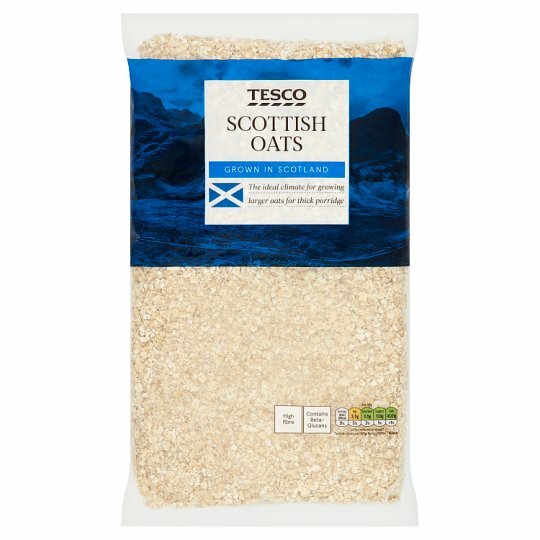 Grown in Scotland The ideal climate for growing larger oats for thick porridge Beta glucans contribute to the maintenance of normal blood cholesterol levels, as part of varied and balanced diet and healthy lifestyle. Contains gluten. May contain wheat. Contains Oats. Oats contain gluten.. Also, may contain Wheat. Wheat contains gluten..
Store in a cool, dry, odour free place and once opened in an airtight container., Contents may settle during transit. Place oats into a large non-metallic bowl, add 300ml cold water. Alternatively milk may be used instead of water to give a more luxurious, creamy porridge. Cook on full power for 2 minutes 30 seconds (800W)/2 minutes (900W), stir then cook on full power for a further 2 minutes (800W/900W). Add sugar or salt to taste. Do not reheat. Instructions: Place oats in a small saucepan and add 300ml cold water. Bring gently to the boil and simmer for 2-3 minutes, stirring continuously. Add sugar or salt to taste.